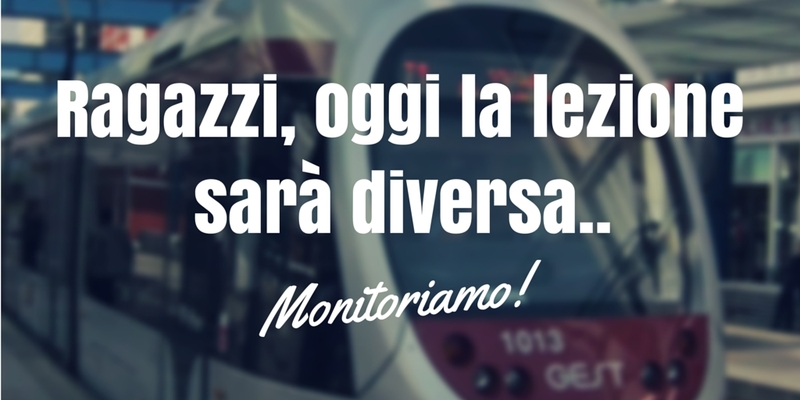 Since the last post on the results of our civic monitoring of public policies, nearly 300 new monitoring reports have been added to the Monithon.it platform, more than twice the number that we had in 2016: 300 new studies, each focusing on one of many projects taking place throughout Italy that are funded by Cohesion (or Regional) Policy. This increase is an extraordinary achievement, making us proud to be part of this experiment in civic monitoring as a proactive way to use public data and to bolster civic engagement and public policy accountability. Every since its creation, Monithon has positioned itself as both a tool and a research method, putting itself at the service of schools, universities, NGOs and local communities, nearly always as a group of volunteers and following with the philosophy of civic hacking. To learn how Monithon came into being and about the people who are the driving force behind it, you can read our post from last year. This year we are prouder than ever, because the quality of the reports we are publishing is constantly improving. The studies conducted over the last two years have, in almost 90% of cases, included an on-site visit to the project headquarters – the infrastructure or the location where a project financed with public funding is being conducted – involving the collection of data, videos, photos, and documents. During these last 2 years, over 95% of our monitoring groups have conducted on-site interviews: 76% interviewed the public or private party that received the funds, and 56% interviewed residents of the local community to assess the project’s effectiveness from the perspective of the final beneficiaries of public policies. 38% were able to directly interview the public representatives responsible for the initiatives (mayors, town or regional councilors, province presidents, etc.) That’s not all: the ability to reconstruct the “administrative history” of funds provided, and the details of that reconstruction, are qualitative aspects that can be observed when reading the monitoring reports, beginning with the map or the list. In almost every case, you can find original videos containing the content of the interviews and each study’s principal findings – investigative data journalism on a small scale! These results are largely the fruits of incredible work on the part of the project team from the OpenCoesione School (or ASOC), from the Italian “A Scuola di OpenCoesione), which uses Monithon during “Esplorare” (Explore), the most important phase in its educational programme in Italian high schools. It is where we can see how adept the students have become at interpreting, understanding and using public data, so as to hold institutions to account for the investments made in their neighborhoods or cities. 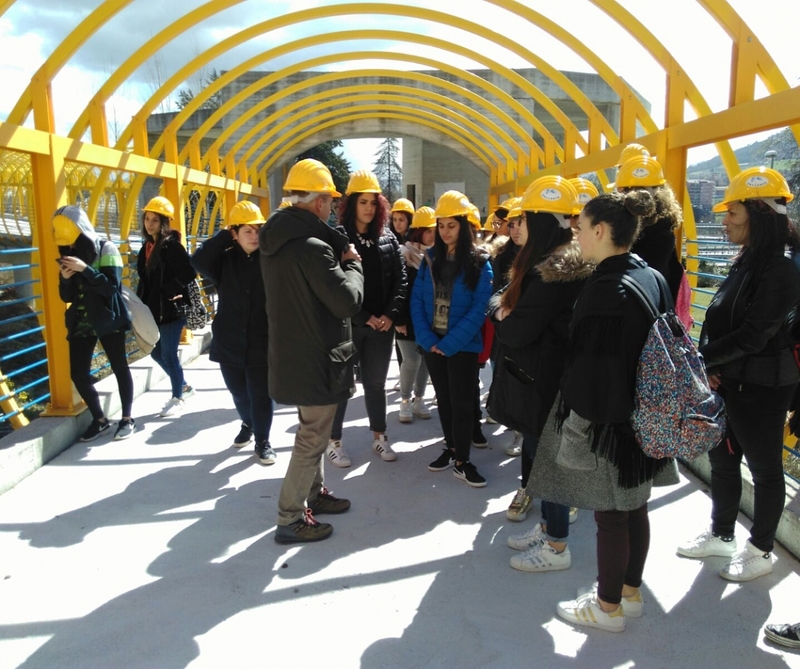 In the most recent edition alone, spanning 2017-2018, around 5000 students were involved, under the direct guidance of 300 instructors working throughout Italy. Nearly 88% of the reports you can find on Monithon.it are the result of these research activities. The OpenCoesione School is constantly growing and raising its profile. Indeed, in recent years, the OpenCoesione initiative, which provides funding and coordination for ASOC from within the Italian Presidency of the Council of Ministers, has contributed to imparting an awareness of the practice of civic monitoring within regional public administrations and within national and European institutions. There is no lack of similar programs at the university level. Thanks to the impetus provided by the Europe Direct center, every year the University of Turin holds a course devoted specifically to European policies and civic monitoring. The work carried out by the MoniTOcamera (2017) and MoniTOsitadela (2018) teams speaks for itself, taking its place alongside earlier studies, which are likewise of the highest quality. In Turin we also find a super interesting spin-off project, whose progress deserves to be closely followed: Monitorino. In addition to providing support to schools and these early experiments in universities – of which the University of Pescara has recently become a part, with its course in Urban Planning – another of the Monithon community’s newest initiatives is the Sibari Integrity Pact (Calabria), which, thanks to Action Aid, has truly taken off, with the introduction of the first civic monitoring schools for members of the local community. 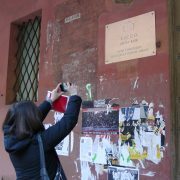 This initiative is a game changer, not only for the Italian Ministry of Cultural Heritage and for local communities, but also for the European Commission, which recently adopted it as a model (see p. 26) for similar future initiatives aimed to fight corruption and encourage civic engagement. In this post, we would like to share with you some of the enthusiasm and enjoyment that we experienced, as well as some of the discoveries – both positive and negative – that were made while putting together these monitoring reports. Here, too, we will begin with an analysis of our civic monitoring results: Which projects were examined? What were the main “assessments” reached? Then we will move on to recommendations for public decision-makers. From the end of 2016 to May 2018, the number of monitoring reports rose from 177 to 475 – quite a leap! Each report, with a few limited exceptions, provides detailed information on a project initially chosen by a monitoring group from a list of approximately 950 thousand projects published on OpenCoesione.gov.it. Thanks to the open data, we can link the findings of the monitoring projects to the principal characteristics of the projects being monitored, such as scale, funding sources, and thematic categories. We thus discovered that the total funding for the projects monitored amounted to over 4.5 billion euros, of which over 3 billions’ worth had been subject to monitoring in the last 2 years alone. Over half of these projects are financed by European Structural and Investment funds (ESIFunds). These are funds managed by the central and regional administrations, intended to reduce the gaps that exist between the different parts of the country (which is why there are many more projects in Southern Italy than in the Central and Northern regions). 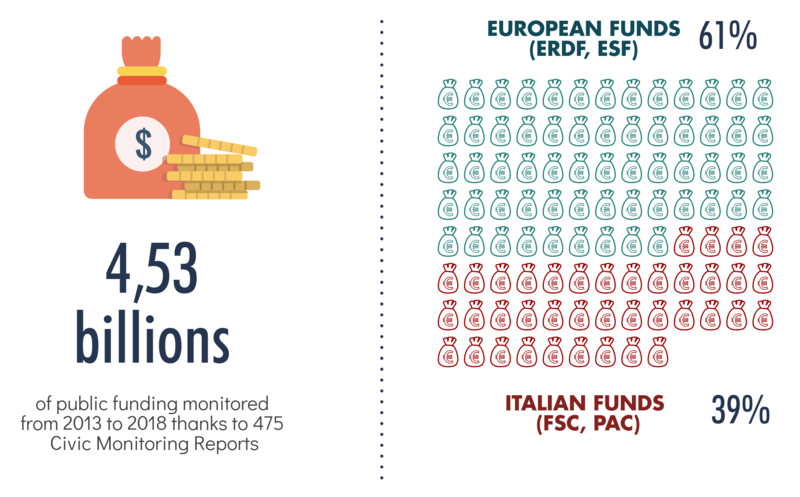 However, the number of monitored projects funded using resources that the Italian government makes available with the same objectives (“national funds”) is growing. Whatever the case, whether these funds are allocated from national, European, regional or local budgets, they are all taxpayers’ money. Using open data from OpenCoesione, we can also categorize projects according to theme. It goes without saying that the enormous resources needed to build or improve transportation infrastructures are also reflected in the sample of projects monitored. 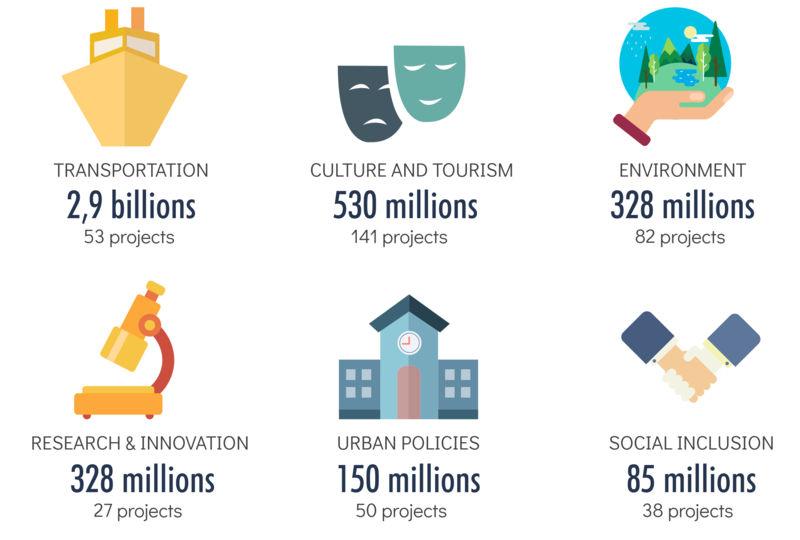 Indeed, the 53 projects that fall into this category account for nearly 3 billion of the total amount of funding. Take, for example, the Crotone Airport, which is expected to provide an essential stimulus for the local economy. As in our last post, the theme that users once again found most interesting was culture and tourism. This category is comprised of 141 projects, for a total of 530 million euros – investments which are essential for our nation and to which the competent authorities, who might be encouraged to participate thanks to civic monitoring, could make a significant contribution. We are talking about a truly vast number of different projects: from the restoration of the Royal Palace of Caserta to the renovation of the Apollo Theatre in Lecce (here is a link in English), from the Capuchin Monastery in Grottaglie (Taranto) to the Chilli Pepper (“Peperoncino”) Festival in Diamante, in Calabria. There is also a new entry to our list of themes: social inclusion, and it is the sixth-most monitored to date. 38 projects, for instance, finance the reuse for social purposes of property confiscated from criminal organizations (e.g. the creation of the Centre for Antimafia Studies in Calabria) or the development of welfare services (such as the “Casa della Salute” health clinic in Bosa, Sardinia). The monitoring groups’ assessments of the public projects they investigate is the most essential element of their activities. Taken as a whole, their assessment has remained largely unchanged over the last two years. The majority of financed projects (64%) earned positive assessments. Of these, over two-thirds have already been completed and deemed to be useful, while the remainder are still ongoing, but what has been observed so far bodes well. Some investments came as a pleasant surprise to the monitoring communities, who had a chance to discover them and explore them in more depth. One such investment assessed during the 2017 and 2018 monitoring was the renovation of the historic town center of Barletta, in Apulia. According to the team, called Reconstructing History (“Ricostruendo la Storia”), the project “led to an improvement in the quality of life for residents of the historic center and a moderate increase in tourism flows”. The solar power plant in Montefiascone, near Viterbo, has also had a positive impact in terms of “economic savings and a decrease in pollution in the surrounding area”. Yet another example is the MArTA (National Archaeological Museum) in Taranto, which, thanks to public funding, “received its highest ever number of visitors in 2016”. The projects that did have problems represented approximately one-third of the whole: 11% have been completed but appear to be ineffective, while the remaining 21% are still ongoing but are having difficulty moving forward. The assessment remained deferred on 3% of projects, which had only just begun. In a little while, we shall go into more detail regarding the difficulties encountered. First, however, let us examine whether or not assessments changed depending on projects’ geographical locations. In this post, we will focus on the 4 regions with the greatest number of civic monitoring reports. They are the main Southern Italian regions in terms of total European and domestic cohesion policy funding received. The region with the highest percentage of positive assessments (68%, just slightly higher than the national average), shown in green in the chart, is Apulia. The region with the greatest number of problems, on the other hand, is Calabria, where just over half of projects received negative assessments. The statistic relating to projects which have been completed is striking, since these are more difficult to remedy. Nevertheless, these assessments are not set in stone. According to the authors of the reports, as we shall see below when we discuss recommendations, actions targeting “surrounding conditions” may restore even these projects’ effectiveness. Moreover, as a general disclaimer, it goes without saying that Monithon’s sample of monitored projects is not statistically representative of the projects funded in the 4 regions. The projects in this sample are way too few and their selection depends on the choices and interests of the students. So this comparison is not about the regions’ performances on managing ESI Funds. What factors determine a negative assessment? The 300 reports most recently included in our calculations all basically confirm the same problems. Aside from the projects which never even got off of the ground – for example due to issues associated with access to funds, the granting of permits or licenses – a large number of public projects (10.9%) became blocked when already underway, due to problems of an administrative nature. The principal problem found, however, was once again a general delay during the implementation phase of projects with respect to planned schedules (on OpenCoesione, for example, you can find information on planned timetables). 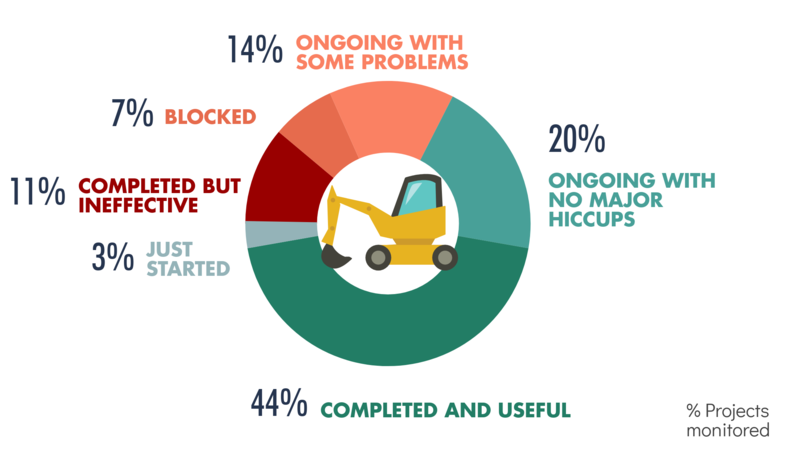 This issue affects 18.1% of total projects monitored. This is the case, for example, with the construction of a biotechnology center, which should be quick to keep pace with the newest developments in scientific research, but at the time of the monitoring visit was already 7 years behind. In some cases, funds are linked to a specific project, one which cannot be separated from its context of implementation. Thus, in the province of Milan, the redevelopment of the wetlands along the Olona River is 2 years behind, “because the park’s redevelopment is linked to other projects related to the river, which have been impacted by bureaucratic complications”. There is no lack of projects which are entangled amidst different funding sources, public administrations which are only partially responsible for them or who do not provide direct access to the work undertaken. In some cases, the students’ dedication is not enough to help us understand whether or not the money has been spent. And if it has been spent, what for? Why, despite public data stating that a large amount of funds have already been spent and accounted for to the European Commission, is there still a “lack of funding”? Here below you can find the doubts expressed by the young people in the “newscast” they put together about the renovation of the old historic district of the village of Senerchia, in Campania (in Italian). Let’s now take a moment to examine the final phases of public project monitoring, which are even more intriguing: results and impact. It is during this phase that the assessments of residents can provide a valuable source of information for administrations. However, with the exception of the most notable projects, residents are unfortunately not able to accurately gauge the usefulness or effectiveness of every financed project. Bear in mind that, even taking into account only those cohesion policy investments made between 2007 and 2015, there were about 1 million financed projects! Civic monitoring groups, however, can come to our aid by applying the principles of “crowdsourcing”, in other words, the ability of “crowds” to collect accurate data by dividing up the work of an assessment – immense in and of itself – into small tasks assigned to individuals (or, in this case, one project per group), in the same way that Wikipedia is collaboratively written. In our case, an analysis of the qualitative data collected shows that only 3.6% of the projects examined were found to be unsatisfactory. This percentage is in line with the findings of our last report, and is relatively low. These are cases in which funding did not lead to adequate implementation. One such example, it would seem, is the water treatment plant in the municipality of Paola (Cosenza), where “sludge disposal issues and problems relating to plant management continue to exist”. We find a similar issue with the funding for the development of a social computing platform for the University of Milano-Bicocca. In this case, due to a lack of additional financing that the university had been counting on, it was unable to do anything beyond the creation of a prototype, which can no longer even be viewed, as it was created using obsolete technologies. Graver still is the case of the Papardo di Messina Hospital’s Oncology Centre, which has unfortunately featured on the news. It simply “does not exist”. 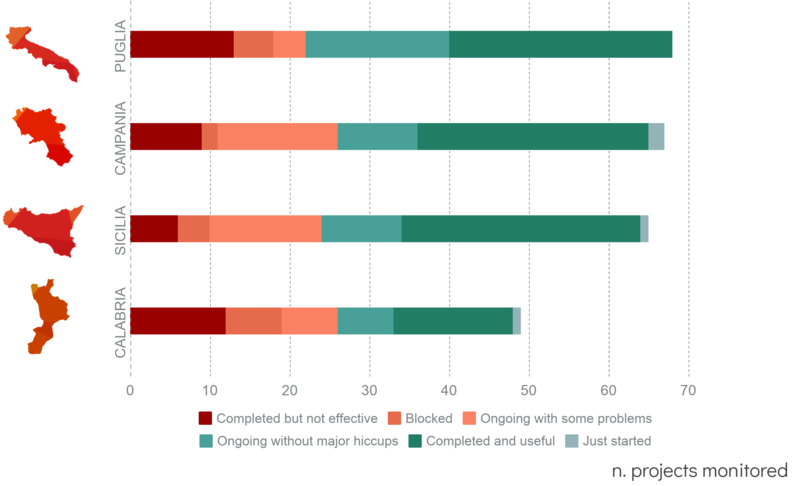 Much more common (10%) are those projects that were implemented with good results, only to be deemed ineffective when viewed in the wider context in which they were made available. Even if the funds allocated for these projects in and of themselves were spent correctly, the effectiveness of the projects for their final beneficiaries remains a fundamental criterion on which any assessment of the success of public policies must be based. This is the case with the Multimedia Mountain Museum in Sicily, which only was open on one occasion, “due to high operating costs and a lack of staff”. Three very similar cases are those of three civil protection plans, for the Municipalities of Marcianise, Palomonte and Casalnuovo di Napoli respectively, which received development funding but invested nothing in communicating what they had done to their local communities – which, as was discovered in the course of the interviews conducted, did not even know these plans existed. 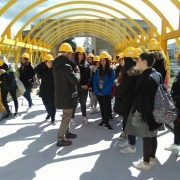 Another example is that of the redevelopment of Piazza Savignano in Aversa (Naples), which was a complete success but, according to the monitoring group “did not bring about the social inclusion which had been the true crux of the project”. Here you can find the video by the extremely capable young people from the FreeDam team, who monitored the Lordo Dam project in Calabria, with the interviews they conducted with local residents and the press conference they organised with the mayor, the bishop, and the president of an environmental monitoring centre. A considerable number of the projects described immediately above constitute a significant subgroup: successfully implemented but useless in the absence of complementary initiatives which could unlock all of their potential effectiveness. The center for the terminally ill in Oristano is complete, but “is still not hooked up to the electricity grid or city water” and “has yet to receive accreditation from the Local Health and Social Services Department (ASSL)”. It is therefore unable to be used, “a cathedral in the desert”. More glaring still is the case of the South Fort in Reggio Calabria, whose redevelopment left our young people “open-mouthed”. “The structure is welcoming and attention has been paid to even the smallest details. The Fort appears suddenly around the last curve in the road, in all of its restored majesty and military linearity.” What a shame it is that the public cannot get to the fort, because the road is impassable and there are no signs to show the way. In 2017 and 2018, the quality and variety of suggestions has continued to grow – a true goldmine of “good ideas” for local decision makers! Overall, the types of recommendations have followed the same trend from year to year. In other cases (7%), the monitoring groups complained of “governance” problems. These occur when public administrations “don’t talk to each other”, and political conflicts and a lack of coordination are piled on top of existing bureaucratic problems. Unfortunately, this was the case with the project for the improvement of the Messina-Palermo and Messina-Syracuse railway lines, worth 28 million in financing. 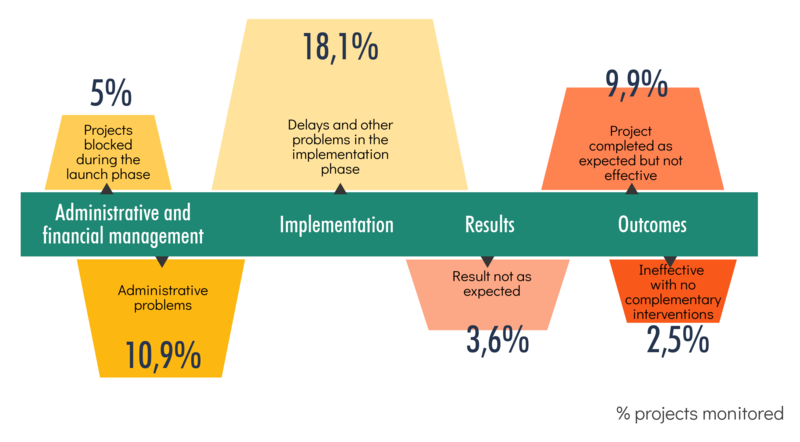 According to the monitoring group, the work is stopped, with only 10% of total implementation achieved, given an absence of “clear objectives on an institutional policy level”. In addition, it appears “essential” that “a network that can coordinate the actions of all of the parties involved be created”. In other cases, recommendations encourage the creation of a collaborative governance system, one which could involve local residents, schools and communities as active participants. For instance, the students from the “Dream Energy” group in Casal di Principe (Caserta) have offered to design and implement “projects that are in the interest of the community, with the active participation of local residents”, so as to raise awareness regarding the extremely useful “Pio La Torre” Centre for Environmental Education and Documentation, a bastion of legality. This is possible thanks to “constant contact between schools and public institutions”. As in past years, the last two years have seen numerous (14%) recommendations for improving communication on the amount of good that public investments – including European funds – are doing for local areas. This applies to projects, both large and small, that have been monitored over the past two years. Even the simple construction of a multistory parking garage in Somma Vesuviana (Naples) can help to meet the need for improved mobility, but it is necessary to have “greater publicity for the project and encourage more people to use it”. Turning our attention to the Municipal Selective Waste Collection Centres in Martina Franca (Taranto), the “civic monitoring team intends to actively contribute to the implementation of an information programme, which has been planned to help raise awareness and communicate methods of use and the importance of this new service. The team is offering to create videos to disseminate this information, to participate in ‘environment days’ in the square, to organise and lead educational-play activities for children, [and] to implement a Telegram bot to inform people about selective waste collection services”. Lastly, the bulk of recommendations focused on specific suggestions regarding individual projects, dealing with issues such as how to unblock a problematic situation or how to improve a key aspect in terms of effectiveness. Dozens of civic monitoring reports contain specific recommendations, which are at the disposal of the local administrations and the companies that are implementing these public projects. For example, with regard to the project dealing with the redevelopment of the Seveso in Sesto San Giovanni (Milan), the students are convinced that “one way to stop the Seveso from overflowing its banks would be to construct a stormwater holding basin, but before the water enters such a basin, it must first be filtered”. The excellent study conducted by the Corsari Assetati team contains a fair number of suggestions on how to use the wastewater generated by the Acqua dei Corsari water treatment plant in Palermo: “uses include irrigation, street cleaning, machine cooling, extinguishing fires, but it could also simply be used for periodic cleaning of the sewer system, so as to prevent the streets from flooding.” These types of recommendations were also discussed on May 22, at a ForumPA workshop. The most interesting potential application of civic monitoring may, however, lie in its ability to determine to which specific project, within the broader area of implementation, funding should be allocated. In this way, it is possible to provide precise recommendations to enable a more fully effective use of public finances, one which includes not only those aspects related to the implementation of planning within predetermined timeframes and administrative and financial constraints, but also takes into consideration the actual usefulness of the project within its local area. It is extremely interesting to note that many monitoring reports, especially during the last two years, have placed great importance on “surrounding conditions”, those which make it possible for financing to truly serve to meet the needs of community residents and local businesses. A case in point is the Epizephyrian Locris National Archaeological Museum, “one of the most important archaeological sites in the world”, which is in need of commitment on the part of national, regional and local institutions for its development and promotion, for example to help “improve the quality of the roads that lead to it, making them more accessible to more effective modes of transport, and for more welcoming hotels and accommodation facilities”. The funding for the Scalea (Cosenza) airfield is also of scant effectiveness if “the Regional public services and hotel infrastructures are not improved so as to better manage tourist accommodation during the summer season”. The same is true for much smaller-scale projects as well, such as the expansion of the Restricted Traffic Area in Aversa (Caserta), which is useless without the “presence of traffic police at the entry points and constantly operating video cameras” or a “geolocation system for bicycles, to prevent them from being stolen”. In conclusion, the potential applications of civic monitoring in the public policy sphere are becoming apparent. What began as a game in 2013 and gained structure as a method in 2014 has taken root, in following years, as a part of actual “classes for the citizens of tomorrow” that are being taught in schools, universities and civic communities, with more people trying it out in ever more useful ways. The monitored projects, while still far from representing any sort of statistically significant sample, have been the object of in-depth studies, which have led to the generation of new data and information and, in many cases, “good ideas” as well. To the public administrations falls the task of knowing how to make the most of them! Altri due anni di monitoraggio civico: il report aggiornato sui risultati di... Come sono selezionati i progetti da monitorare?